Akismet is bundled in with WordPress and likely already installed on your WordPress site. After you activate Akismet, a notice appears saying that the plugin requires additional configuration before it will function. Check for an activation notice after you install any plugin. Although most plugins don’t offer such a notice, if one is available, it lets you know how to get started with the plugin. The Akismet plugin always has an activation notice after installation. The link in the Akismet notice goes directly to the settings page for Akismet. 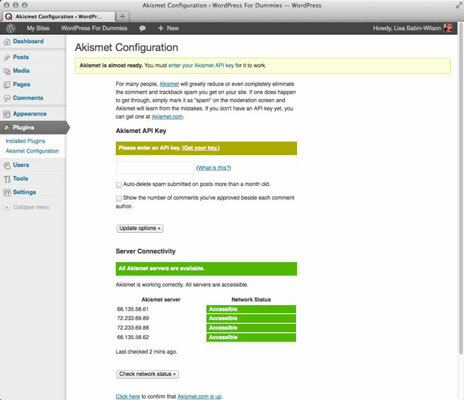 After you activate the plugin, Akismet creates an Akismet Configuration submenu entry under the Dashboard’s Plugins menu. Select this entry to get to the settings page. The Google XML Sitemaps plugin is a good next step for diving into plugin settings pages. Google XML Sitemaps has a number of options and shows just how intricate settings pages can get. 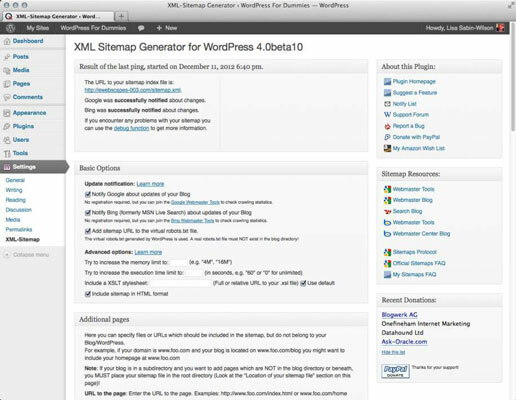 Google XML Sitemaps is one of WordPress’s most popular plugins, with more than nine million downloads. Google XML Sitemaps makes it easy to automatically add support for sitemaps to your WordPress site. Although most WordPress sites can be scanned easily by search engines, adding sitemaps adds a level of safety to ensure that all the content on the site can be found. With default settings, the plugin automatically generates sitemaps as content is added or modified on the site. In addition, it notifies Google and Bing of these updates so that it can update the search engine cache with this new data. The Google XML Sitemaps plugin settings page is available from the XML-Sitemap submenu of the Dashboard’s Settings menu. Notice that the menu name is different from the plugin name. Like the Akismet plugin, Google XML Sitemaps requires an additional step for it to be fully functional. Unlike Akismet, Google XML Sitemaps is very quiet about how to get set up — it doesn’t provide that Dashboard-wide notification message. This is why it is very important to carefully read settings pages and plugin documentation. It can be very easy to miss something extremely important. Below the information box used to generate and regenerate sitemaps are the settings for the plugin. Along the right side are resources about the plugin and about sitemaps. This type of format is not uncommon for plugin settings pages. Scrolling through the page reveals just how exhaustive the available settings are. The settings range from basic options such enabling or disabling automatic sitemap generation when the site’s content is changed to options that control the information in the generated sitemap to advanced options that control how many server resources the plugin can consume when generating the sitemap. Nearly every aspect of the plugin’s functionality is represented as an option on the settings screen, offering a large amount of flexibility in how the plugin functions on the site. This type of settings page setup is present in many popular plugins. Although the settings can be excessive for some users, most users can get very good results by simply using the default settings. In plugins such as Google XML Sitemaps, the settings are available for people who desire extra control over the plugin’s functionality. The All in One SEO Pack plugin, also known as AIOSEOP or AIO SEO, focuses on improving the SEO (search engine optimization) of your WordPress site. With more than 13 million downloads, All in One SEO Pack is one of the most-downloaded plugins on the WordPress Plugin Directory. All in One SEO requires some additional configuration to function. 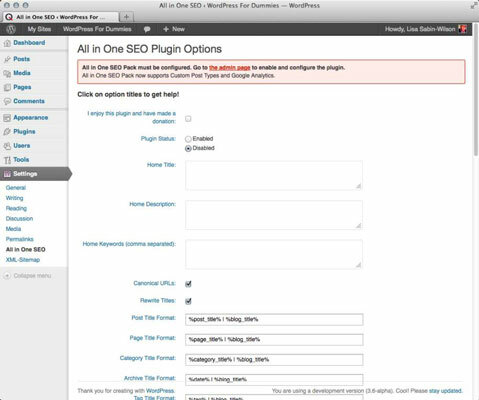 The All in One SEO plugin notifies you that additional configuration is required after it is activated. The link in the notification leads directly to the settings page for All in One SEO. The Plugin Status setting is set to Disabled by default. To activate the plugin’s features, change the status to Enabled and click the Update Options button at the bottom of the settings page. The settings page for All in One SEO has a variety of settings to control many features of the plugin. The portion of the settings page shown includes a large number of settings to control the titles on the site. Typically, titles are controlled by the theme and are modifiable only through code changes. Opening control over titles without requiring code modifications is one of the primary reasons why SEO plugins such as All in One SEO are so popular.